Mountain High - Strongest El Nino Since 1997/98. What Does It Mean To You? Strongest El Nino Since 1997/98. What Does It Mean To You? Says the National Oceanic and Atmospheric Administration, "There is a greater than 90% chance that El Nino will continue through the winter of 2015/16, and around an 80% chance it will last into early spring." El Nino 101 - What Does It Mean To You? You heard it! El Nino isn't being predicted. It's already here! And by all accounts as big as the 1997/98 phenomenon which dropped 310 inches of snow on Mountain High, the most in recent history! Click here to see our annual snow fall. As Pacific Ocean temperatures continue to warm and trade winds shift, federal scientists say that the El Niño weather event that's emerging could be one of the strongest on record. With Southern California desperate for relief from its punishing four-year drought, the trend is significantly increasing the chances that storms will drench the state this winter. Scientists say the conditions are lining up in ways not seen since the winter of 1997-98 when downpours filled reservoirs and sent skiers/snowboarders flocking to the mountains. "This is great news for skiers and snowboarders." 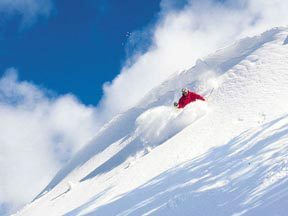 said John McColly, Mountain High's CMO, "There are obviously no guarantees, but above-normal snowfall is becoming more likely." The chances are now "greater than 90 percent" that El Niño conditions which began in March will remain through this winter according to the monthly El Niño report from the National Oceanic and Atmospheric Administration. That's up from 85 percent last month and 50 percent from four months ago. "We are on the right path now, says California's state climatologist, Michael Anderson. We want to see it continue to strengthen and build -- and certainly to not weaken any time before the new year." El Niño is a disruption in the weather patterns over the Pacific Ocean when the ocean's surface warms more than normal. Those warm waters release heat, changing wind directions and the jet stream. Strong El Niños, which occur when the Pacific Ocean is the warmest, have historically been linked to wet weather in Southern California and South America. 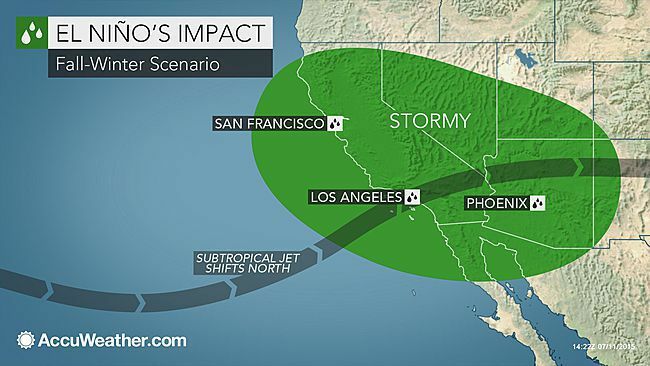 To be sure, California's next rainy season won't start in earnest for five more months. And many of those will be hot summer months with a high fire risk because the recent drought has left grasslands and forests bone dry. Scientists also caution that promising El Niños have fizzled out in the past -- most recently last year. But with each passing month, many scientists now say, this year is looking more and more like 1997. That year, an ocean area that is a key indicator of El Niño was 1 degree Fahrenheit warmer than normal from April to June. Currently the water there is 1.6 degrees higher than average -- the warmest since 1997. Shon Connely remembers that soaking winter of 1997-98. "It was unbelievable," he said. "I skied fresh powder once a week for five weeks straight. It wouldn't stop!" So what became of last year's El Niño predictions? The water was warm, but it didn't trigger significant changes in wind directions or the jet stream experts say. This year, those changes are already underway. "It's well coupled with the atmosphere. That never happened last year," said Jan Null, a meteorologist with Golden Gate Weather Services in Saratoga. "We get our rain from the atmosphere, not from a warm ocean. The fact we are seeing the coupling is one of these checked boxes that is pointing toward a strong event." See more at these official El Nino resources.